Axe Brands – Who Makes The Best Axes? 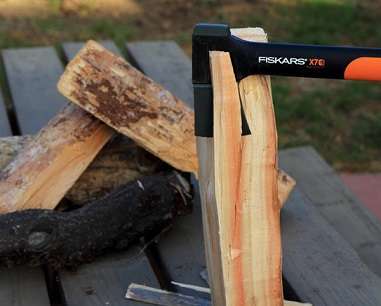 The Fiskars X7 Hatchet, part of the X-Series and to avoid any confusion, the X7 is the newer model of the 14-inch Fiskars tool. This incredible tool combines top-of-the-line materials with expert construction and ingenuity to bring you a nearly unbreakable, ultra-sharp hatchet with 3 times more biting power than your traditional hatchet. Complete with a FiberComp® shock-absorbent handle, friction minimizing blade coating, and insert-molded head, this tool will go through three times the wood twice as fast! Designed in Billnäs, Finland, Fiskars is a leading supplier of effective, practical tools that have been around for over three centuries. Plus, with the lifetime-limited warranty, you can truly depend on this product. Since 1649, the experts at Finnish owned and operated Fiskars have been creating quality products designed to make the lives of everyday individuals like you and me easier. The X7 14-inch hatchet was designed with precision power-to-weight swing speed and, despite its light handle, it is perfectly balanced and delivers an intense chop with each swing. Some of the exceptional features include the hardened forged steel which, after some research, I discovered the steel is HRC 50 – 56. The strategically cut geometric head features a unique over mold design to help ensure the head will never detach from the handle. Additionally, the head is coated with a low-friction finish to help it drive through wood without getting stuck. This tool is perfect for hikers, campers, and every day outdoor enthusiasts. It is ideal for chopping brushwork and logs that are small to medium in size. The non-slip grip gives the already stronger-than-steel shock-resistant FiberComp® handle added assurance and comfort so you can feel confident when handling this tool. Plus, a limited lifetime warranty and a hardcover sheath with locking mechanism and handle are included with your purchase. For the price of this hatchet, I highly recommend it. It can absolutely stand the test of time, and will chop through kindling and split wood with ease. Aesthetically, the tool is attractive and intimidating. The brand name is beautifully embellished on the side of the handle, and the orange grip towards the bottom gives it an industrial look with a pop of color. A hole is located towards the end of the handle, giving you a space to tie a lanyard to wrap around your hand when using or to strap to your belt with. Don’t let its weight fool you! This lightweight tool is a force to be reckoned with. This is a great tool. I’m having trouble finding anything wrong with it. It’s cheap, it’s lightweight, it’s heavy-duty, and it is virtually indestructible. A simple Google search will find videos of trucks running over the handles to demonstrate its durability. 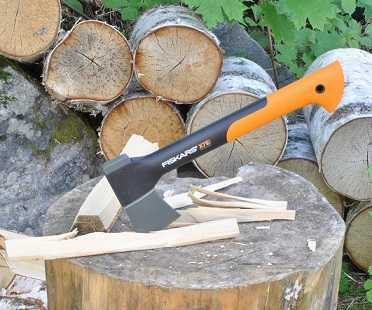 Backed by Fiskars lifetime warranty along with its history of more than three centuries of quality forged tools, the X7 is absolutely worth it! Its biting power will make chopping kindling and firewood an easy task, and the head is designed to give you a clean, one-strike split with small to medium sized wood. The tool is perfectly balanced and is forged from hardened steel. The handle is shock-absorbent, slip-resistant, and the head is externally forged to the FiberComp® handle. The textured grip gives you incredible handling and helps reduce straining in your hands. In addition to these built in features, the sheath that is included makes carrying easy and helps protect not only the user but the blade as well. It locks to keep the blade from accidentally slipping out though this does prevent a quick deploy. Overall, I definitely recommend this hatchet. Welcome to Axeing.org! 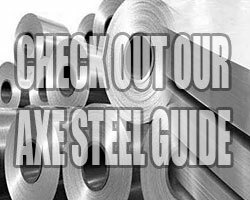 Our goal is to help you find the best axe for your specific requirments. Copyright © 2018 — Axeing • All rights reserved.